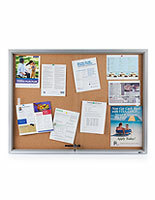 Is your corporate lobby or waiting room in need of new sliding door cork boards? 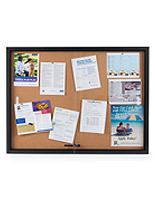 These lockable notice boards are widely used in the business world. 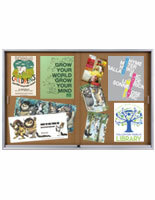 The aluminum framed, sliding door cork boards are also commonly used in school and churches. 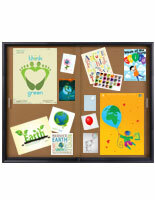 Locking notice boards are ideal for keeping important information posted while keeping it free from being tampered with. 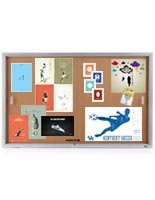 Sliding door cork boards, also called enclosed bulletin boards, come in a variety of sizes, color and finishes. 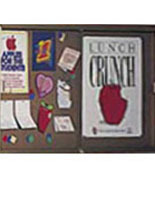 The cabinets offered in this category are generally used to display announcements or proclamations which need not be vandalized. 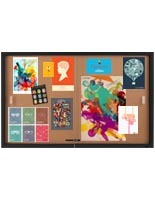 What are the main features of the bulletin boards in this listing? 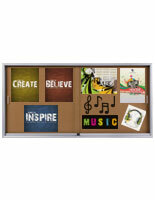 Sliding door cork boards feature tempered glass fronts for optimal safety. 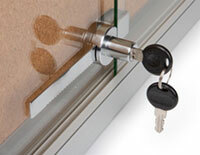 This very important feature is a must have when dealing with large pieces of glass. In the event of an accident this safety feature will allow the facing to fracture into many smaller safer pieces than large sharp shards. Traditional overlapping doors allow for not only full view of all of the treasures posted inside but they protect said postings as well. The locking mechanism is situated in the middle of the unit at the very base well out of the way of the main focal points of the mounted unit. High end aluminum construction. Aluminum is one of the best materials for making assemblies like this since it is highly durable yet extremely light weight. Size! 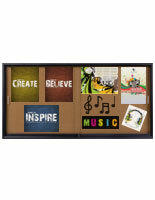 These are large units, most of the items in this category measure in at a massive six feet wide! 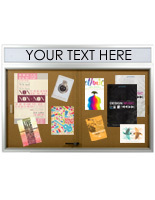 Unlike most bulletin holders these models command attention. Users can upload large or small pieces of art work or listings or any other thin item in these models without fear of taking up too much room! Fabric bulletin enclosures for office use are also ideal in places like nursing homes, schools and community gathering locations like town halls. Another common location for these aluminum frame enclosed cabinets is in a visitor's center. 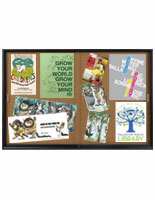 These locking bulletin holders can be used in schools in both common areas and in the classroom. These models are outfitted with lockable glass doors and cork backing. 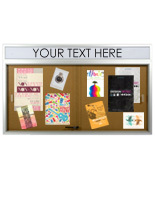 Some of the featured models in this category have a built in header area to display a company name or monthly school classroom theme.